1. Open master slides for editing. In the top menu select “View” > “Edit Master Slides”. 2. 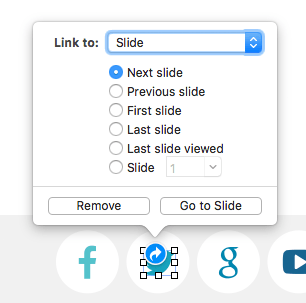 In the sidebar you will see all master slides available for use in your presentation. Choose the master slide that uses logo, link or information you would like to change. You can a change text information as a regular text block. 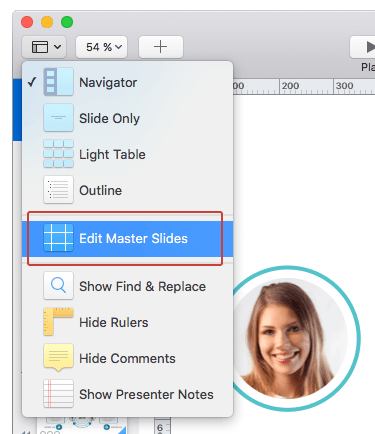 Remove the default logo of the presentation and insert your own by dragging it from the folder to master slide working area. 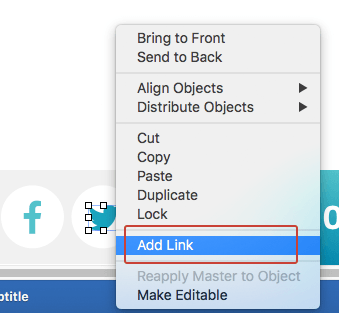 To add or change link, right-click on the element, in the pop-up menu select “Add Link”/ “Edit Link”. In the pop-up window enter the link to your website/e-mail (“Link to: Web page or email”) or select the internal redirect through the presentation (“Next slide”, “First slide”, “# slide”…). You can also remove the link by selecting the “Remove” button.